Tap-Tap's Sunken Cave is a level in Yoshi's Island DS. This cave is inhabited by several Tap-Taps, featuring every variety of them in the game. The level of the water rises and lower during great parts of the level. The last part of the cave is in a lava area. The beginning of the level is a small meadow, inhabiting only a few Tap-Taps. In this screen, Yoshi must push a crate onto an orange switch panel; when performed correctly, two metal rods unlock and allow access to a pit. Once the player has entered the pit, Yoshi lands inside of a small, dank, watery cave inhabited by bats. Here, Yoshi finds a Winged Cloud; once the winged cloud is broken, a Warp Pipe appears allowing access to a deeper area of the cave. In this lower part of the cave, large mobile rocks parade around; Yoshi must avoid these large rocks in order to continue forth in the level. Yoshi eventually finds another warp pipe that leads to an even deeper section of the cave. In this part of the cave, Yoshi encounters rising water levels. He must avoid multiple Tap-Taps and Gusties in order to continue in the level. Once Yoshi makes it past this area of the cave, he enters the final section of the cave. 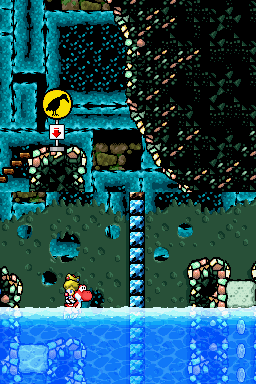 In this section of the cave, Yoshi must be carrying Baby Mario in order to pass. Yoshi must run at a very high speed from a Super Big Tap-Tap. The Tap-Tap continuously tumbles after Yoshi, destroying the path along its way. If Yoshi falls from the path, he lands in a large river of lava. Once Yoshi reaches the end of the path, he must Flutter Jump onto a safe area of land, from which he can reach the goul roulette, thus ending the level. This page was last edited on April 15, 2019, at 02:10.